There's No Run Like A Prison Run : The Two-Way In Oregon, organizers of a program that lets inmates of a maximum-security prison run with regular citizens say the goal is to provide a sense of purpose, and normalcy. Runners chat at a recent track event at the Oregon State Penitentiary in Salem. The prison's program allows inmates (in blue shirts) to run alongside regular citizens (in orange). Themed outdoor running events have grown in popularity, with participants flocking to races that promise unusual settings and obstacles (including zombies). But for decades now, an Oregon track has hosted a rare event: races run by inmates of a maximum-security prison alongside regular citizens. That's the story brought to us by Oregon Public Broadcasting, whose Lucy Ohlsen visited a recent race at the Oregon State Penitentiary in Salem. The race bibs bore the slogan, "Run for your life." The Salem prison running program got its start with help from legendary runner (and Oregon native) Steve Prefontaine back in the 1970s, with the goal of helping inmates cope with incarceration and rehabilitate themselves. In recent years, athletes and coaches from the University of Oregon have visited to lend their support. The Salem facility's races — a 5K and a 10K — are held on a quarter-mile oval track at the prison each month, culminating in September's High Wall Half Marathon. "Beginning on this track, the race tours through the weightlifting area (the iron pile) and handball courts in the shadow of the 26-foot penitentiary wall," reads a sign-up notice posted by the prison. "These are normal people," program coordinator Todd Gulley tells Ohlsen of his fellow inmates. "You wouldn't know the difference if they weren't wearing blue." The races are no-frills affairs: no snack stations, no fancy gear. But the prison has a wait list for the program that inmates say helps them stay in shape and work off stress. "Running around this track, chasing whatever you're chasing, there is a way of putting it behind you," inmate Robert Goggin tells Ohlsen. "It's not easy for inmates to get into the running program," Ohlsen reports. "The first requirement is 18 months [of] clear conduct. 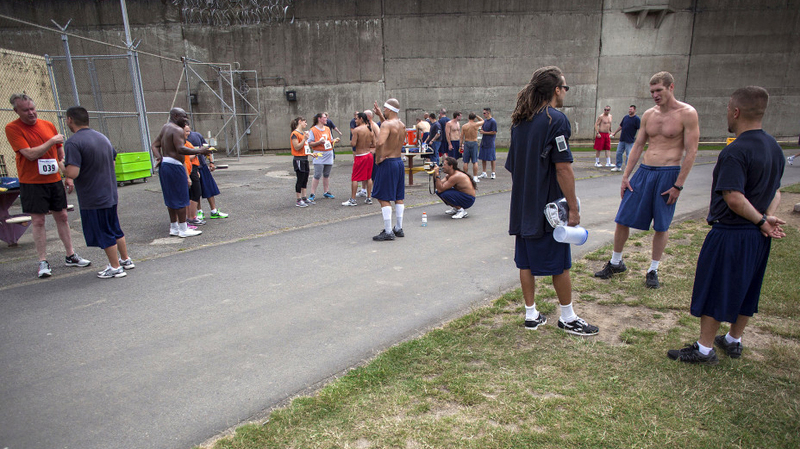 Only 150 inmates can participate at a time. The institution houses more than 2,000. Wait time to get in the program is about four years."